East London port operates from 06h00 to 22h00 for marine services. On request 24 hour service is available. Port office hours are between 08h00 and 16h00 Monday to Friday (excluding public holidays). The entrance to the Port of East London is dredged for ships with a depth ranging from 11m to 14m, 170m width at the narrowest part and with a draught alongside the berths ranging from 8.5m to 10.4 metres. The port can accommodate vessels of up to 245m. Draught at the various berths range between 8.5m and 10.4m (grain and oil berths). The port is serviced with a fleet of three tugs - two 1978-built 43ton bollard pull Z-Peller tugs Mpunzi (ex Dirk Coetzee) and Umthwalume (ex Coenie de Villiers), a 1980-built 43 ton bollard pull Voith Schneider tug named Chardonnay (ex WH Andrag) (query - this tug may now be at Saldanha) and a workboat/tug of the Tern class named Tristan Tern, which has a 19t bollard pull and which entered service in July 1998, plus a harbour launch. Pilotage and tug assistance is compulsory. Dredging of the port and approaches is performed by a dredger sent from Durban as required. Marine services are available between the hours of 06:00 and 22:00 (Monday to Friday - see above). The NSRI maintains a station base at the port and has a rescue craft named ACSA Rescue One available for emergencies at sea. East London handled a total of 330 ships during the calendar year 2015, with a gross tonnage of 11,475,890. Cargo handled in 2015 amounted to 2,945,922 tonnes, including containers. Bulk cargo totalled 1,054,352t and breakbulk cargo 996,614t. Containers by weight amounted to 894,956t (66,293-TEU). Imports amounted to 1,340,348t and exports were 710,618t, with nil recorded as transhipped (bulk and breakbulk excluding containers). 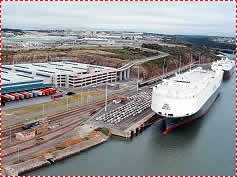 The port handled 53,819 TEUs during 2011/12, of which 26,217 were imports and 27,602 exports. A majority of containers were for the local motor industry. East London port has 11 commercial berths ranging up to 250 metres in length. Fresh water is available at all berths on request. Bunkering is available (fuel and gas oil) by road tankers. The Grain Elevator, with a storage capacity of 76,000 tonnes is the largest in South Africa. In the 1970s the elevator handled 3.8 million tonnes of exports and in 1994 a total of 2.1mt, during a time when the Durban facility was out of commission. In recent years the elevator has been converted to handle discharged cargo (imports) and has handled World Food Aid imports on behalf of the United Nations. Nowadays the Multi Purpose Terminal handles mainly containers - 66,293 TEUs during 2015 using ships own gear as the port now possess a mobile crane and straddle carriers. The Car Terminal on the West Bank has been responsible for a turnabout in the port's fortunes and is geared to handle 50,000 units annually, which it has already exceeded, and has space for expansion when required. Bunkering with fuel oil and marine gas oil is available at the port from pipelines at S and T berths on the West Bank of the harbour. Cruise ships use any available berth, usually on the East Bank. Ship repair facilities are extensive with a well equipped dry dock able to handle ships up to 200m length with a 106-metre ship repair quay alongside. A full range of ships chandling and stevedoring is available. The port houses a yachting marina within the harbour at Latimer's Landing where there was a small waterfront but which is due for refurbishment. The NSRI maintains a rescue vessel named ACSA Rescuer One plus an inflatable named Spirit of Madiba.